Alnico Magnets, Ferrite Magnets,Rare Earth Magnets, Flexible Magnets, Demagnetizer,Magnetiser, Hand Magnets, Lifting Magnets, Magnetic Chucks,Magnetic Sweepers,Hump Magnet, Coolant Separator, Suspension Magnet, Plate Magnet, Chip Conveyor, Bullet Magnet, Magnetic Chute, Magnetic Pulley, Over Band Magnetic Separators, Magnetic Chuck,Magnetic Coil, Magnetic Pump, Drum Separator, Magnetic Grill,Barrel Grates Separators, Funnel Magnet,Gauss Meter,Magnetic Stirrers,Roll Separator, Magnetic Rack, Paper Band, Table Top Gauss Meter,Digital Flux Meter,Liquid Line Separator, Magnetic Rod, PM Lifter, LCPM Lifter, Stream Magnets,Magnetic Holder, Magnetic Sheet Fanners, Magneto therophy, Water Treatment. Star Trace Magnetics, Indian authority in advanced technology with 25 years experienced Global support & 75 Years for Magnetic, Matel Detecting & Vibratory applications, Designs, develops, manufactures & markets magnetic separation, metal detection and materials feeding, screening, conveying and controlling equipment for process and metalworking industries. Star Trace Pvt. 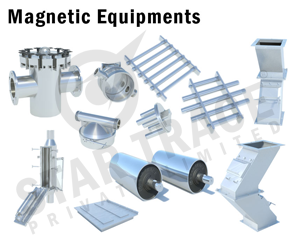 Ltd. is manufacturer and supplier of magnetic & vibratory equipments used in various industrial applications. It exports a wide galore of magnetic equipments such as Magnetic Chip Conveyor, Rare Earth Magnet, Suspension Electro Magnet, Liquid Line Magnets, Metal Detector, Induced Roll Separator, Suspension Fork Lift Magnet, Magnetic Pulley , Barrel Magnet & so on. Address: No:7, Jeevanandham street, Redhills, Chennai - 600 052, India. Phone: (0091- 044) 26418456, 26419439, 32975456.